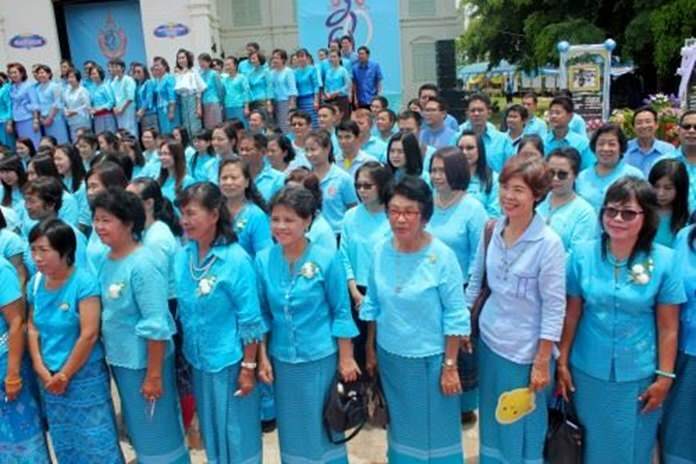 Pattaya City invites Thais and tourists to wear blue on National Mother’s Day. Pattaya is encouraging Thais and tourists to wear blue shirts to honor Queen Sirikit for her 86th birthday Sunday. Government workers, police and military are required to wear the royal attire, but city hall also wants to see the public follow suit throughout the month. A long slate of activities are being held around the country to mark the occasion. No information was forthcoming from Pattaya City Hall about local events, but they released the following information which may or may not be in effect here: regarding regional areas and overseas, provincial governors and ambassadors are assigned to operate a blessing ceremony and hold activities on August 12 as appropriate. There will be a Dharma Practice Project August 11-13 at Buddha Mountain and dharma retreats across the country. Additionally, Permanent Secretary of the Prime Minister Office said that on this auspicious occasion, the government would like to invite the public and private sectors and all civilians to decorate their buildings and homes with HM Queen Sirikit’s photo, Thai National flags, and flags with “Sor Kor”. Moreover, blessing books will be set up for people to sign and the government sends out an invitation for everyone to wear blue throughout the month of August to honor the Queen. Also, since it is Mothers’ Day, many local restaurants and hotels will be featuring special events for the occasion to honor mothers everywhere. See our Community Happenings beginning on page 33 for a sampling of what’s available.